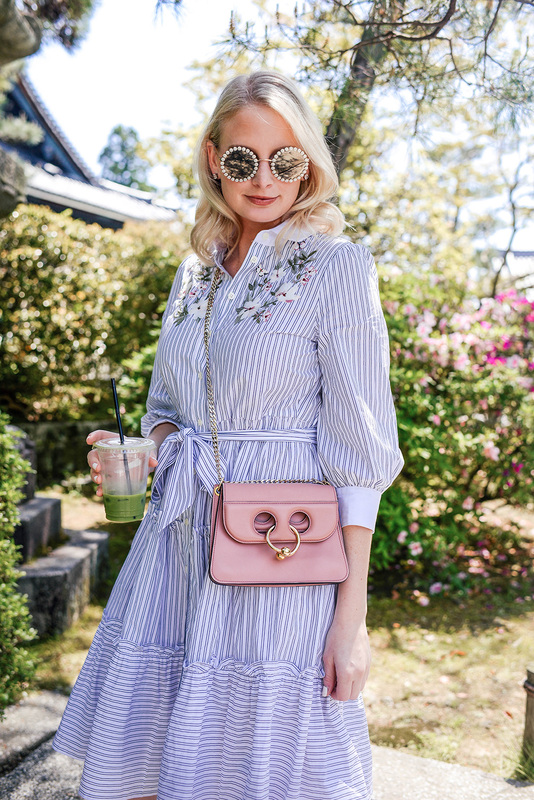 When I saw the embroidered flowers on this striped shirtdress, I knew it would be perfect for my Japan trip! Even though we barely missed Sakura season, the embroidery reminds me of the cherry blossoms you see throughout the country at the turn of the season. As you’ll see from most of my dress choices on this trip, I opted for knee-length or longer silhouettes pretty much the whole time. I’m normally a fan of a shorter hem so I can show off my legs, but considering the in-between weather (chilly mornings and hot afternoons) and the chance for gusts of wind, a midi length seemed like the more appropriate choice! kate spade new york has a bunch of really gorgeous dresses for spring, featuring a variety of hem lengths for every gal. SHOP MORE OF MY KATE SPADE SPRING FAVES BELOW! In addition to the one you see in this post, I also packed this adorable off-shoulder number! The colors are divine. I wish this dress had been available before my trip, but it just came out! Obsessed with the print. If you love a pineapple print, don’t miss this style. Looking for a style you can wear to church? This midi is modest, flattering and features the prettiest mini bloom print! This dress is a simple, stunning option for just about any weekend activity. It also comes in this colorful striped version! Loving the palm tree print and ruffle detail on this sleeveless shirtdress! This embroidered dress seems ideal for any al fresco situation… which is maybe why it has the word “patio” in the name? Adore the mixed print and color scheme on this poplin collared shirtdress. I love those sunglasses! They look so cool on you. I normally opt for shorter shifts too, but recently I’ve been appreciating the midi length more. It feels really classic and pretty; I love all your finds, the striped dress is lovely! That Kate Spade dress is so cute! I love this on you! Especially with those cute shoes. That dress is so cute and so perfect for Spring.